I have moved a mere mile or two from my previous home to my new abode at Churchill College, and yet it feels as if everything has shifted: my centre of gravity is this crucial mile further west and everything I do is altered. Walking into the centre of town is now a very different experience, the route changed and consequently the perspectives subtly altered. I no longer know exactly how long it will take me to get to Sainsbury’s or to the station on my bike (although I haven’t yet missed a train as a result of the few extra minutes I need to add on) and I have to recalibrate all my timings. It is curious how disconcerting it is when everything is the same only different. However, from my perspective, change is good as a general rule. I’ve always followed that rule in terms of my research, moving on from one field to another in what has felt like a logical and orderly process but which has meant I’ve never felt as if I was stuck in a rut – or in danger of becoming a pedantic expert in the minutiae of a tiny area. That I would find less than satisfactory. So taking on a new life as head of a Cambridge college, with all its attendant new challenges (and ones considerably more substantial than the time it takes to bike to the station) should be immensely rewarding. The students, so recently pouring back into the city, have to consider their new lives too, new responsibilities and new challenges. You will be unsurprised to hear that what seems to have been an increase in misogyny within the student community in higher education in general is much on my mind, but this is simply part of the bigger picture of needing to treat everyone with respect. College life provides a close-knit community where it ought to be possible to ensure no one slips through the net of distress, depression or other concerns. However it also brings attendant dangers of always being close to a certain someone who may rub you up the wrong way – or worse. That sort of febrile atmosphere was neatly described for a bygone age in Dorothy Sayers’ Gaudy Night, although I hope I have not moved into the pages of a detective novel. Looking at things from a new angle is perhaps just another way of expressing the idea of lateral thinking, thinking outside the box and all those other mantra that tell you how to be creative and original. But there is no doubt that shifting one’s viewpoint does enable you to consider issues afresh. For anything from an organisation changing its firm of auditors regularly to researchers tackling a scientific problem with a new battery of techniques, this idea applies. I didn’t expect my physical relocation meant I would look differently at the city I have lived in for more than 30 years, but so it seems. While I get on top of the challenges and issues that the college faces (not the least of which is how to increase the number of women applying, something that is of course dear to my heart), I have more minor challenges to face. A new office, a new PA, between us we have to work out how to file papers so that we both know where to find them! I have a new IT system which so far is proving disappointingly perplexing: reading my college email when on the train seems not entirely straightforward, and yet that is where I inevitably want to be able to deal with my inbox. And, perhaps for me one of the most difficult problems, living in a house (‘The Master’s Lodge’) which is semi-public requires me to discard a lifetime of being untidy and make sure I stick by the adage ‘a place for everything and everything in its place‘. This does not come naturally to me but I have no choice. Earlier this week approximately 130 Freshers came to the Lodge for a meet-and-greet session and if, as my natural messy self might feel inclined to do, I left my shoes strewn round the hall a domino-collapse of the procession of students might have ensued. I am pleased to say, by exercising appropriate restraint on my disorderly self, this sad outcome was averted. 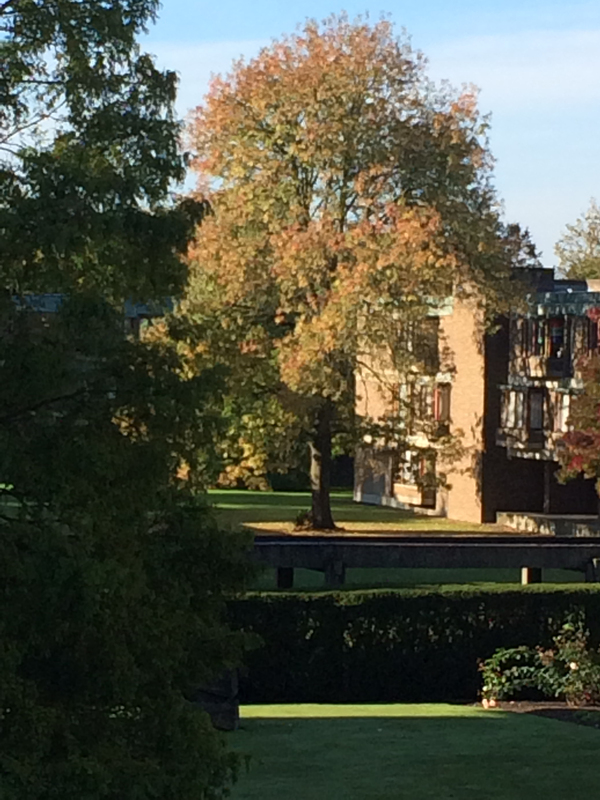 View of Churchill College grounds from the Master’s Lodge. This fine autumn has given me some splendid views. What of the students themselves, so recently uprooted from their childhood homes and plonked down in a modern (by Cambridge standards) college? Time will tell which ones thrive in their new atmosphere and which find it altogether too different or daunting. But I would hope that their relocation, away from the familiar safety of teachers they may have known for years and their parents’ tender ministrations (assuming such applied) may jolt their intellectual creativity and capacity and enable them to rise to the academic challenges that will undoubtedly be thrown at them, as well as all the other (not-quite-so-academic) opportunities that university life provides. This entry was posted in College Life, Science Culture and tagged Cambridge, Churchill College, students. Bookmark the permalink. One factor in getting more women to apply to your new college is getting more girls interested in STEM subjects at an early age. Here is an interesting blog by Sarah Lamb on the topic and an interview with Tim Berners-Lee (but you will have to follow the link to YouTube for that). If you enjoyed Gaudy Night, Athene, you will probably appreciate ‘Zuleika Dobson’ by Max Beerbohm, perhaps the first “woman on campus” novel and set in Oxford. One of the biggest hazards met during the walk from Storey’s Way to Sainsbury’s is surely Madingley Road’s silent, speeding cyclists . At least one could hear Stephen Hawking’s rapid approach. Possibly before you joined OT, Athene, but I wrote a blog a few years ago about how we (as a family) came to be the owners of an ex-Churchill College dining table. The table has a connection to Churchill’s first ever female fellow.